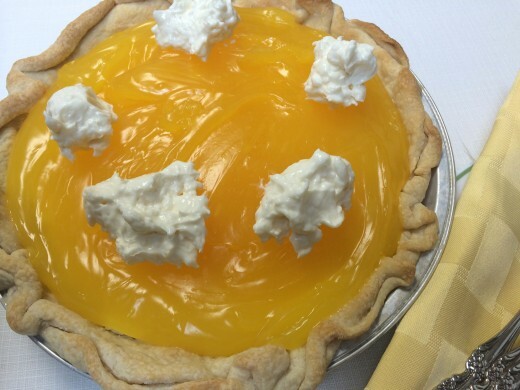 Tangy lemon pie with cream cheese has been a hit with my family for over fifteen years. I’d been looking for another pie recipe using cream cheese, since Mom’s Strawberry Pie—also using cream cheese—is my favorite. I was pleased when I found this one. 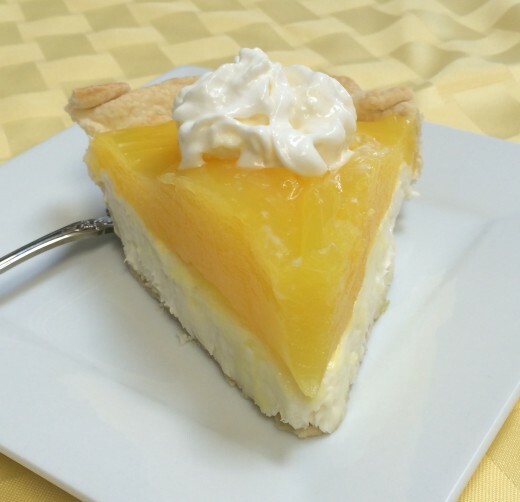 This recipe provides the tart lemon flavor much like you would find in a lemon meringue pie. Instead of the meringue, which I’m not crazy about, this has a layer beneath the lemon to soften it’s tangy taste. Cream cheese, sugar, and whipped topping combine wonderfully to add richness and flavor with the lemon. It’s satisfying, very filling, and serves up beautifully, especially after chilling overnight. It’s a very colorful, pretty dish to serve too. Perfect for special occasions, potlucks, dinner parties, or family gatherings. It firms up beautifully too, which makes it easy to cut into smaller slices and serve. Another point in its favor is that you make it the day before. I love that. It needs to chill overnight. If you are planning a get together, isn’t it nice to know dessert isn’t something to make last minute? That can be a major stress reliever in my opinion. Your pie can be out of the way, chilling in the fridge, while you fix dinner or entertain guests! We love it and so do our guests. It gets an all round thumbs up. For lemon filling, combine sugar, cornstarch and salt in a medium size pan. Once it is well blended, stir in water. Bring to a boil at medium heat, then lower the temperature. Cook for 3 to 5 minutes,or until thickened, stirring often. Remove from heat and add butter, food coloring, and lemon zest. If still not fairly thick, cook an additional few minutes. When it seems nearly finished, gently stir in lemon juice, then cook until very thick. Allow the lemon mixture to cool while you make cream cheese filling. In a medium or large mixing bowl, beat together cream cheese and powdered sugar until smooth. Stir or beat in whipped topping and lemon juice. Set aside ½ cup for garnish. Spread the rest of the cream cheese mixture into the pie crust. I like to bring the cream cheese up the sides too. Pour the lemon filling on top of that, spreading it evenly across the cream cheese layer. When ready to serve decorate with remaining cream cheese mixture. You can use a pastry frosting tool, or simply spoon out in little scoops on the top. I love my hand mixer! Not only does it handle any task I’ve given it, but it is so easy and lightweight to use compared to a big counter top mixer. Often that is more than I need. The other feature that i’m crazy about is the snap on case. Sound silly? It is so convenient to fold the cord up and snap on the cover. You can see from the photo, it takes up so little room, with all the parts kept together. No cord that is always in the way. Pies look beautiful in deep pie pans. The 2 inch depth of these allows for plenty of filling, which can mean more servings too. I love this set of two, since most recipes make two crusts, it’s handy to have the extra dish. These are pretty enough to serve in compared to metal pans. They clean up beautifully in the dishwasher, and will last you for years.